Atlas Copco BD Dessicant DryerAtlas Copco’s BD blower purge desiccant air dryers are designed for a long lifetime of reliable operation. They use a combination of air from an external blower, heat and minimal compressed air, and incorporate unique, patented technological innovations and energy-saving options. BD dryers provide you with the clean, dry air you need to extend the life of your equipment and ensure the quality of your end product. They are available in a range of sizes with a pressure dewpoint as low as -40°C/-40°F, and come in an IP54 protected cubicle. 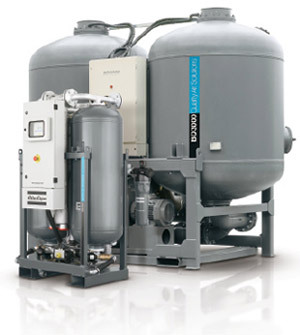 Reliability – Atlas Copco’s BD desiccant dryers eliminate system failures, production downtime and costly repairs by removing moisture from compressed air with a pressure dewpoint as low as -40°C/-40°F. Reduced energy costs – Optimally sized pipes and valves ensure a limited pressure drop. Options are available to increase the efficiency and reduce the energy consumption of your BD dryer. Space-saving – The BD’s all-in-one design leads to a small footprint, saving valuable space in your facility. Efficient control – The control system – fitted in an IP54 cubicle for easy cabling and safety – ensures proper operation of your BD dryer. Low maintenance – Delivered ready for use, installation of your BD dryer is straightforward, cutting costly production downtime. All internal components are easily accessible to facilitate maintenance. The use of high-grade desiccant and high-quality valves results in three-year maintenance intervals.